REVIEW: I was exhausted when I left the theater. This is one of those edge-of-your-seat, gasping-for-air types. It is intense and startling. It will scare you and it will make you chuckle. You will feel desperation and hopelessness but you will urge Robert Neville (Will Smith) on. You will reflect on the question “what if I was in that situation, how would I handle it?” Well Robert seemed to be in complete control and well prepared to handle the situation as a good soldier/scientist should. He is still human though and all alone except for his dog Sam. “My name is Robert Neville. I am a survivor living in New York City. I haven't seen another person in three years. If there is anybody out there. Anybody. Please.” With the limited dialogue in this movie due to the nature of the story, when you hear a line like that you can’t help but to feel his anguish. As he struggles to find a way to fix this infection, his battle with the infected grows more and more difficult to fight. He begins to crack. Will Smith is a very well rounded performer. After putting critically acclaimed roles under his belt such as in Ali and Pursuit of Happyness along with his already established action movie abilities, this one was right up his ally as a combination of both. This role for Will is very similar to the Cast Away role for Tom Hanks. Granted, Will’s performance does not quite reach Tom’s masterpiece, but it is worthy of praise nonetheless. Speaking of Cast Away, I Am Legend does resemble several movies besides the fact that it is another version of the Richard Matheson novel by the same name. There was a version called The Last Man on Earth in 1964 with Vincent Price and a 1971 version with Charlton Heston called The Omega Man. As far as more recent movies that this one will remind you of are 28 Days Later, Invasion, Cast Away, and I, Robot to name a few. Yeah, I, Robot because certain scenes when the infected humans are attacking Robert are reminiscent to the robots attacking Spooner not to mention they both star Will Smith. So if you like those movies mentioned, you will enjoy this one. Not necessarily Will’s best work, but still a great job providing the meat around the bones of this story. And that is important because the story portrayed in this version is quite simple. The beef lies in the drama of the situation as well as the visual presentation. Will handled the drama part and the visual was not too shabby either. It would have been nice to have a little less computer graphic visuals, but considering the scenario you can’t blame them for going that route. It was convincing enough and seeing a desolate Manhattan was truly amazing. “God didn’t do this. We did!” Is Robert defending God or denying His existence? There are some religious undertones that surface during this movie. The main character himself is thrust into a God-like or Savior-like persona trying to save humanity. His drive is not ambition but more like responsibility and determination. Director Francis Lawrence seems to like to explore religious subject matter. When it comes to Francis I have to admit that I am a little biased because his previous major motion picture Constantine with Keanu Reeves is one of my favorite movies of recent years. Now that Francis has added this work to his name, I can more officially say that I am a fan. I think something weird, specially about those deers, it's said that "dogs" are not infected via air, but what about other animal?? How come those Bird, Deers, and Lions are fine? how come the electric and water supply still working (when no one is working for 3 years)? maybe i missed something, I just didn't get it. one of the best movies i have ever seen. Will Smith is an incredible actor. This movie makes you laugh, cry, and stay at the edge of your seat. I thought the movie was great. Will Smith is an awesome actor. The ending made you kind of think "aww" but it was a really good movie. When you think of it should we really trust these drug companies to put stuff in our bodies? I loved the action in the movie. The only reason I am not giving it a perfect score, was I felt the end could have been explained better. Like whether or not humanity was saved through Smith's sacrifice and his cure. Even though it was a remake...with Charleston Heston, it was a very good movie from the beginning to the end. Will was great and the monsters had me jumpimg I must admit. The ending was well suited....believe in GOD and he will show you the light and lead you away from darkness. But sometimes you must die for what you believe. As he did for us. LOVED this movie in fact i watched it twice. It was great both times around and i will buy it the second it comes out to dvd. and to answer yoyos question/misunderstandig he had generators for electricity. as for the water im not sure. the beginning of this movie showed nothing to be excited about. it was really boring, and only had two scary scenes. and for my guy friends it wasnt scary at all. i dont like the idea of a 1-character movie, and the commercials made it seem like he just discovered he was the last man on earth, when really he knew it was going to happen all along. I dont like how they said that Godwas fake all the time, it was quite annoying. the ending was kind of stupid IN MY OPINION. but, in this movie, there was really no other way to end it. this was definately not will smith's best movie. I like a movie like this, a one man film or a movie which is noiseless, you can simply tell the situation as an artist and architecture in profession, and I greatly find irresistible those scenes. This runs for best picture. Speaking of God as Smith said, its only reflecting his character as a survivor but he still needs to know why he is only the one, besides of you think deep, you can widen and imagined why he speak that. Sense on this movie is for artistic people. This is enormous. You can watch this twice so you learn the situation. I also watch this twice and i even cried in some scenes. This is an action-suspense thriller which will keep you on the edge of your seat if, of course, that's your thing. Will Smith's performance is good as is the alsation's. The premise is so simple, however, that I felt the Legend was ever so slightly contrived. The writers seem to have struggled to think up what happens next. It could be compared with the recent War of Worlds film, in some respects. You'll have to suspend belief that there would be electricity and running water in post-apocalyptic New Yor, however! Unfortunately, I could not. Very nice movie, great special effects - story could have been better. Will Smith - full marks on acting. Its tough to pull off a one man show in a movie. Not as good as Tom Hanks in castaway, but the best he could have done in this role. YOYO and PLANKTON - Run your imagination - Solar cells have at least a 20 year life. The water reservoir in NY supports 19 million people each day. So for water to run for 1 man (and 1 dog) for 1,100 days is not a miracle. 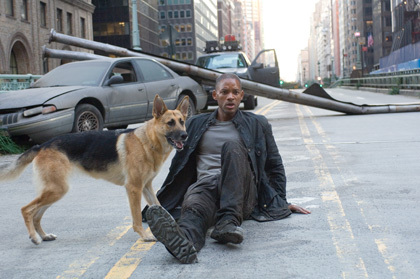 This was one movie I was really hoping to enjoy, because Will Smith is one of my favorite actors. Unfortunately, I didn't like it half as much as I wanted to. Although the creature effects were awesome, I felt that the script was weak. I am so used to hearing Will toss off at least a dozen one-liners per minute. I believe that in this way, the script let him down. Also, after a while, I got kinda bored watching him talk to mannequins. I can only hope that Will's next film, "Hancock," is better. This was the First Movie I have seen in YEARS and Years that had me captivated from start to finish. I was on the edge of my seat and I "m a Thriller/Horror movie connasuer. I think the Whole Movie was great! Dark and eerie and actually had me jump more than once to which suprised me since Horror/ Thriller movies this day dont seem to have that heart pounding , holding my breath , oh no factor. I am buying this movie and adding it to my 100 plus collection which mosly contains black and white or 70's- thrillers when alot of the movies were psycological and got you feeling edgy. The sound effects were outstanding..Silence and then Wham! Scared me every time every turn.